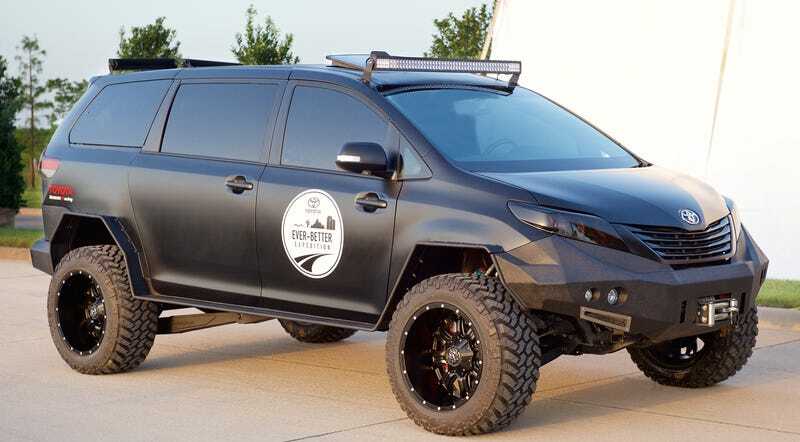 Toyota’s “Ever Better Expedition” sounds like the coolest corporate retreat ever; it’s a 110-day transcontinental drive with a fleet of Toyotas including a Land Cruiser 200 and this absurd Sienna minivan, which they’re calling the Ultimate Utility Vehicle. Just as we were saying Toyota was too stodgy to build something with a sense of humor, they roll up with this thing. The Juke-R might be faster, but I wouldn’t want to piss off the mom dropping her kids off in this warwagen. The van, which as you’ve probably already guessed is actually a Toyota Tacoma with a Sienna body expertly grafted to it, is being built for the SEMA aftermarket show and will join Toyota’s big adventure for its North American portion which started today. The entourage of Toyotas is basically roaming around to get employees excited, show off the company’s wares, and in the case of the van; psych up little kids. They’re going all over US from Alaska to Pikes Peak to Death Valley To Daytona Beach to NYC. I said all over. The L200 Land Cruiser isn’t quite as intense looking as the Tacoma/Sienna but I’m sure any off-road fans who spot it roaming the US with its snorkel and Victorian license plate will get pretty fired up. Keep your eyes open for these guys, they could pop up pretty much anywhere!